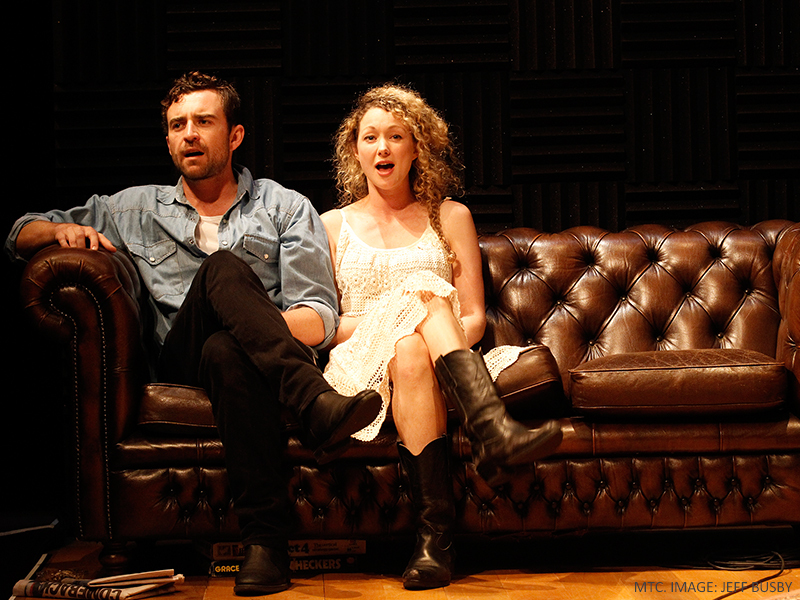 What Rhymes with Cars and Girls is the first of three premieres in the Melbourne Theatre Companies 2015 season. 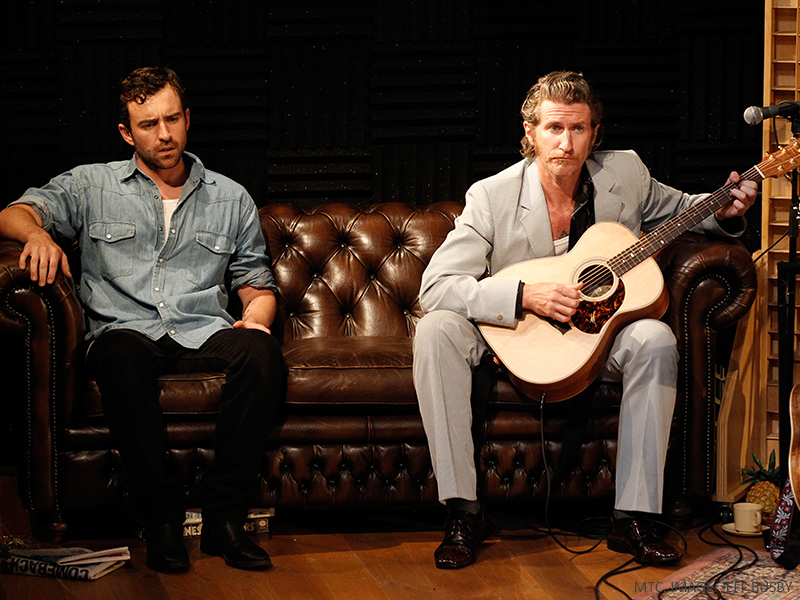 The play portrays two Australian lovers, Jonno and Tash, from very different backgrounds, as they struggle to overcome the class-divide between their families. Fennessy takes Australian musician Tim Rogers’ first solo album (What Rhymes with Cars and Girls) and weaves the songs in to his colloquially Australian script. Although some might describe the production as a musical in an interview with The Guardian Fennessy said that he is not a huge fan of musical theatre and that this production is more like its cousin. 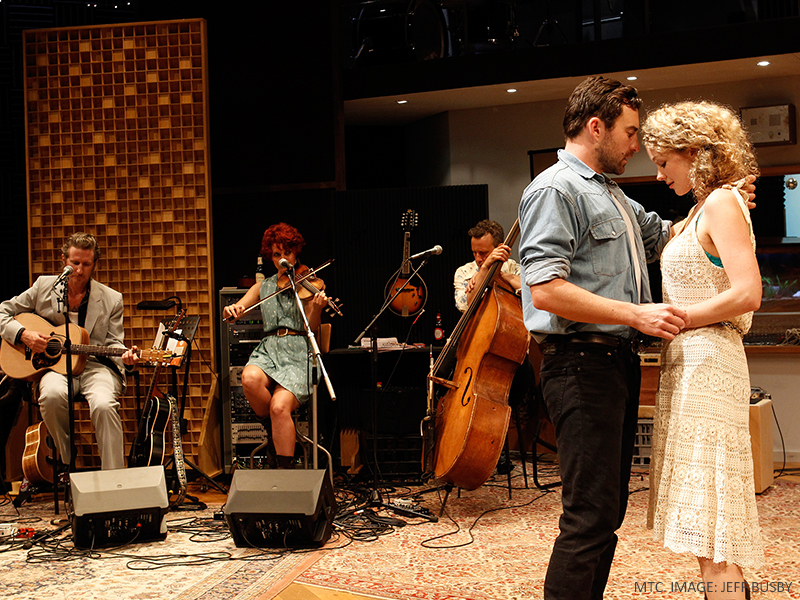 The two person cast of Johnny Carr (Jonno) and Sophie Ross (Tash) were joined on stage by a three-person band, Tim Rogers, Ben Franz and Xani Kolac, who nestled themselves in the back corner on the first of the double levelled set. The whole production was very relaxed, with actors communicating with band members, the odd ad-libbed moment with an audience member, which whilst pleasant at times reminded me that i was in the theatre and not a fly on the wall observing the emotional rubiks cube of Tash and Jonno’s relationship. Whenever Rogers and his band played and Jonno or Tash sang along the whole theatre was a buzz. When the band put their instruments down to let the dialogue flow they were occasionally quite stiff, awkward and unnatural in the theatre environment, this however is just picking hairs at what is a fantastic example of fresh Australian theatre. The class divide between the two families could be described as a classic like love story but Rogers incredible lyricism complimented by Fennessy’s ability to produce this script, that explores love in many facets like pain, death and hate rather than just lust, attachment and sunshine and rainbows detaches itself from the cliche. Leaving the theatre feeling happy is always a good thing, but productions like this that leave you contemplating well after the curtains have closed like What Rhymes with Cars and Girls did for me are the true gems. The Melbourne Theatre Company has a fantastic seasons this year and offer incredible discounts for people under 30. Scanning the theatre before this production I noticed that only around 10 percent of the sold out audience would have been under 30. So I challenge everyone to get out from behind their screens for a couple of hours this year and watch some theatre, if not for anything else, just to give it a go.